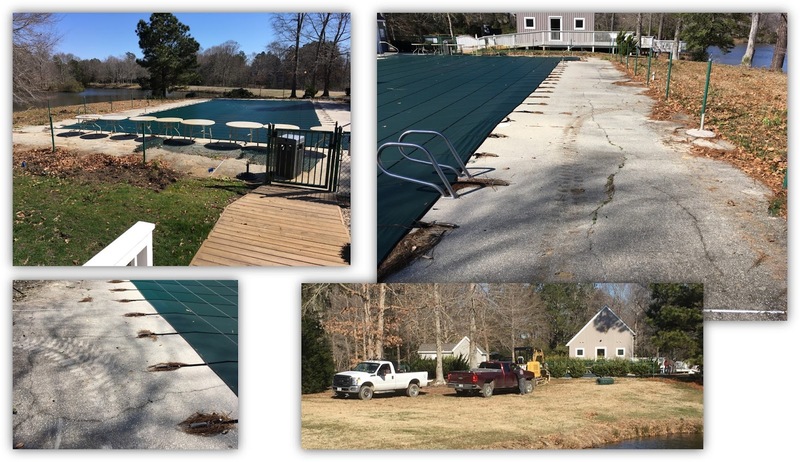 After a 30 year run our pool deck is in need of replacement and the HOA Board has spent the last year evaluating options and has awarded the contract for it's replacement. At the same time the pool skimming piping will be replaced as it too has failed in a few places. This work had been outlined on our long term capital plan and has been properly reserved in our capital fund to pay for the work. Neighbors - thank you so much for your generosity of non-perishable items for the less fortunate. We collected over 500 pounds of food items. Diana Skelton and Kathy Bevins distributed the food to FISH and Grove Outreach Center. Both organizations were extremely happy to receive our donations. 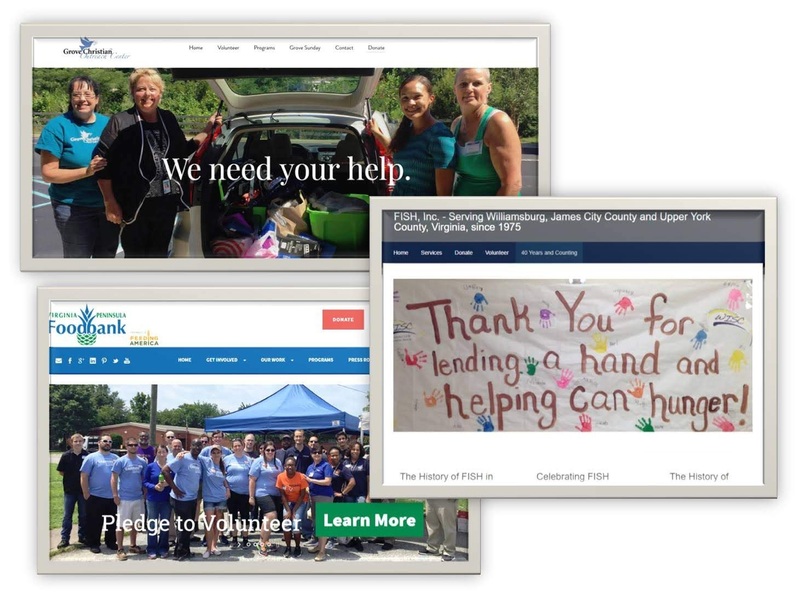 Based on an established formula our donations will contribute to over 500 meals. I'm so proud to be apart of such a loving and giving community. 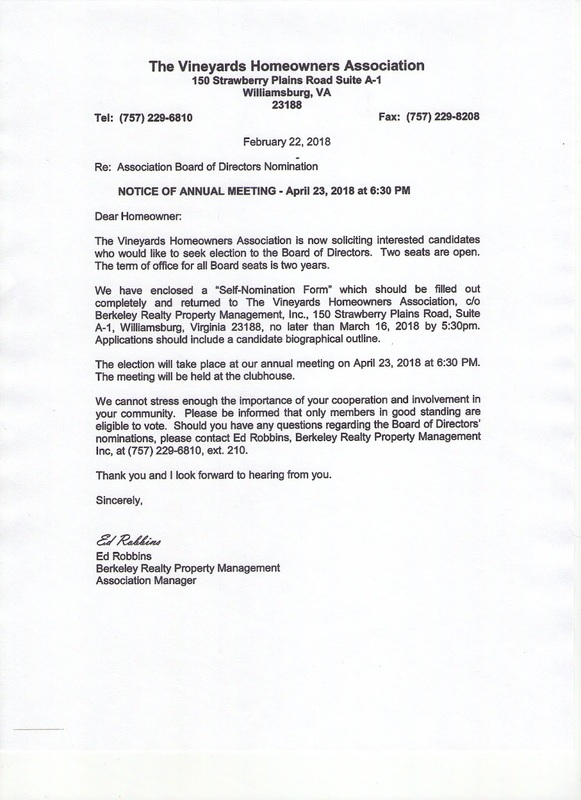 Way to go Vineyards - thank you! 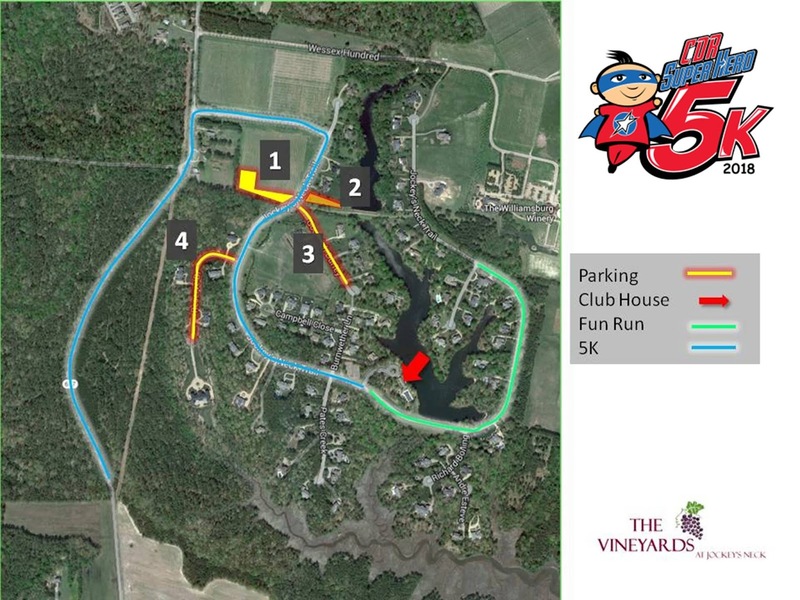 Once again the Vineyards At Jockeys Neck will be the venue for the Annual Childhood Development Resources (CDR) 5K run which is one of their premier fund raising events for 2018. CDR is a non-profit organization who provides vital help to individuals and families who have developmental needs in Williamsburg and james City County. To learn more about their heroic mission please see their website at www.CDR.org. 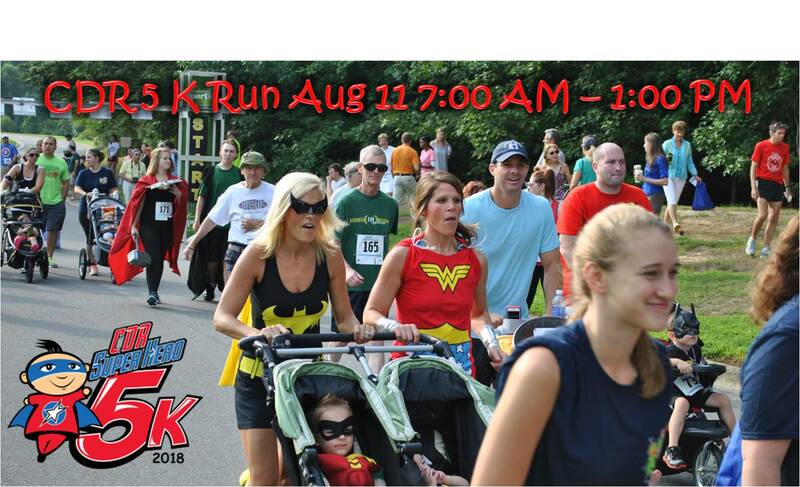 We work closely with the CDR volunteers to minimize the impact on traffic in our neighborhood during the event, but please keep in mind that during the Fun Run (7:30 Am - 8:30 AM) and the 5 K run (8:30 Am - Approximately 9:30 AM) Jockeys Neck trail will be closed to traffic from the clubhouse to lake Powell road while the event starts and after 9:30 Am the runners will be on Jockeys Neck trail so traffic will be slowed. Please plan accordingly. The CDR staff will begin setup at the Clubhouse parking lot on Friday afternoon beginning about 3:00 PM. If you have contractors wil large trucks, the area around the Clubhouse on Jockey's Neck Trail will be limited regarding height from Friday afternoon until about 3:00 PM Saturday. This is because the starting line timing equipment spans the road and is about 9' off the ground. Please make note of this. Parking for the event will be in 3 primary areas - the first is the grass field on the South side of the vineyards. Once this fills then the field across Jockeys neck Trail leading to the upper dam will be used. Once areas 1&2 are filled then cars will be parked on Goodrich Durfey (volunteers will ensure that no driveways are blocked if parking on the road is necessary) and finally on Reserve drive (again, volunteers will ensure that no driveways are blocked if parking on the road is necessary). You can print out a copy of this map by downloading the PDF file at the bottom of this page. The back gate of the Vineyards (at the end of Jockeys Neck Trail near the Winery) will be open for those residents who are past the clubhouse and can be used to enter and exit the neighborhood. The event should be wrapped up by early afternoon and of course the run is weather-dependent. 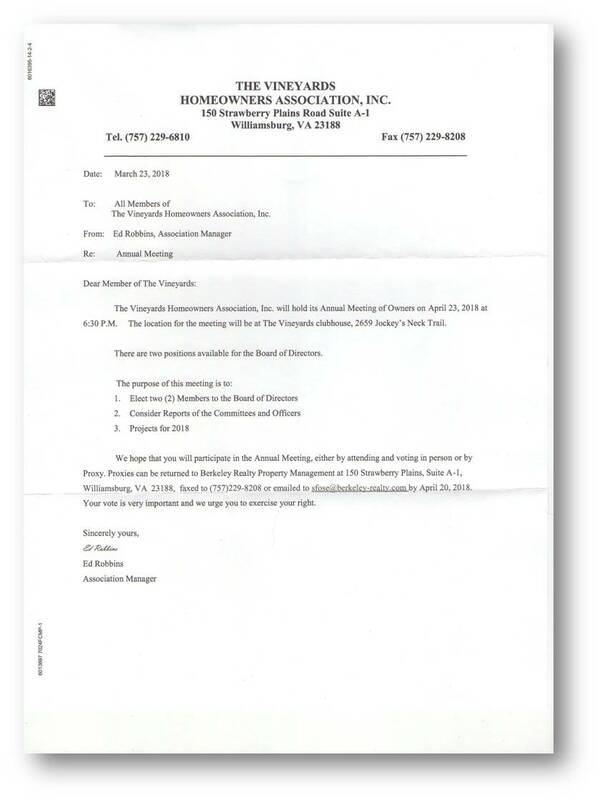 We will send out an email to notify residents should there be schedule changes. We should all be very proud of this significant contribution to our community - CDR very much appreciates it! 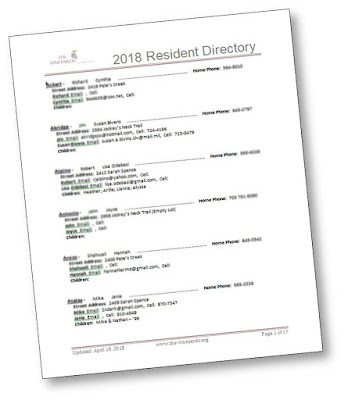 Our Vineyards Homeowners Directory has been updated for 2018 and is now available to those who request it. It is easy and fast to get one, just CLICK HERE to send an email and request the latest version by giving your name and address. A PDF file will be sent to you for you to either print out or save to your computer. As is always the case, if you see incorrect or incomplete information please contact the website administrator by CLICKING HERE to send an email with changes, inclusions or omissions. 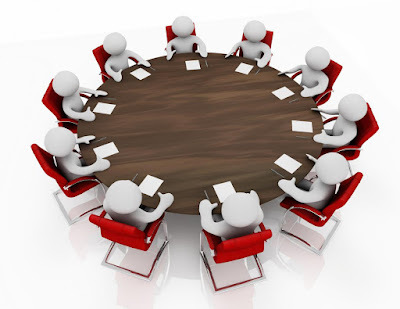 Mark your calendars now for our annual meeting to be held on April 23, 2018 at 6:30 PM in the Clubhouse. Please read the following second notice - see you there! We have a unique opportunity to participate in the National Audubon Society’s upcoming event. 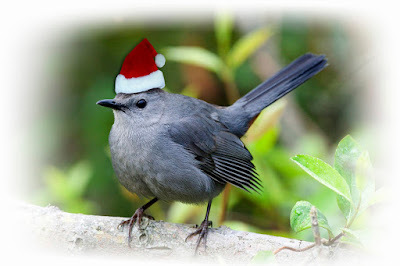 The Audubon’s 118th Christmas Bird Count is upon us. Thanks to the guidance of Dr. Daniel Cristol, Professor of Biology and Ornithologist at the College of William and Mary, and our neighbor, Greg Davis, we can contribute to the Williamsburg Bird Count on December 17. This early-winter bird census is conducted annually with over 100 years of citizen science involvement. The data collected by CBC participants have become one of only two large pools of information provided to ornithologists and conservation biologists that indicate how the birds of the Americas are fairing over time. The Williamsburg CBC will be conducted on Sunday, December 17th. To participate, grab your favorite Birder’s Field Guide, binoculars and Williamsburg CBC Species Tally Sheet is attached at the bottom of this post. Plan to spend a minimum of 1 hour counting the birds on your property. Dr. Cristol will be in our neighborhood to count the birds in and around the lake in the early a.m. and Greg will walk our public areas later that morning. For the sake of accuracy, please document birds observed on your property only, unless you know that your neighbor is not participating in the event. Submit your findings to Greg Davis, no later than 3:30 p.m. on December 17th via his email, grdavis@kaufcan.com. We will have copies of the Species Tally Sheets at our upcoming Vineyards Neighborhood Holiday Party at the Clubhouse this Thursday, the 14th. 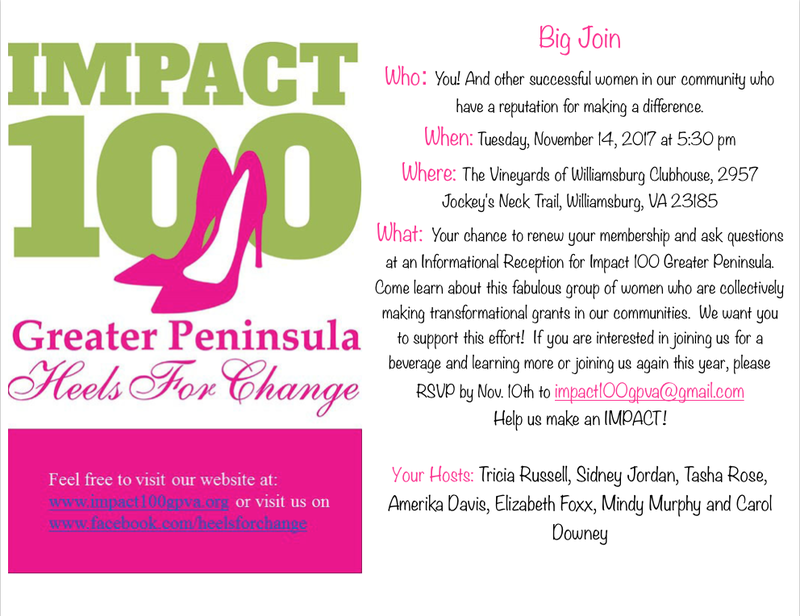 Two of our long time Vineyards residents (Elizabeth Foxx & Amerika Davis) are on the Board of Impact 100 Greater Peninsula and are co-hosting an event at our Clubhouse on November 14th at 5:30 PM and Vineyards women are invited! The organization has given away $200,000 worth of grants over the past few years to transform communities. 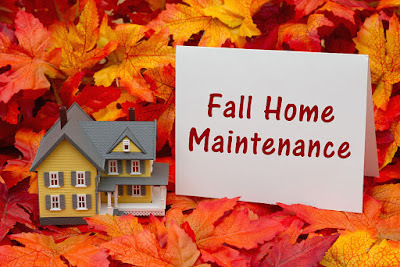 While the weather may say otherwise, it is that time of year for you to have some basic maintenance done on your home & property. For those with irrigation systems, we are coming to a time where you really should consider getting your system winterized. As you may be aware, water freezes at 32 degrees F, but what you may not know is when it does freeze it expands. Many times the only place freezing water has to go is out, so that can cause splits in pipes and fittings. When it thaws the split becomes very apparent once water pressure is returned. Irrigation systems are mostly underground and if deep enough freezing may not be likely, but there are winters where the frost line can reach the sprinkler line and it this happens then bad things can happen. So in the “better safe than sorry” world you should consider having your system winterized. The process is that the system has high pressure and volume air put into it and the existing water is blown out of the pipes (of course the water is turned off to the system first!). Another important system that many homeowners have is a whole house generator. These are to be serviced at least once a year with the service being an oil and filter change at a minimum. Many also have spark plugs and the air filter changed, but given the little run time this may not be necessary. It is also good to have a general inspection of the system and the integrity of the starter battery checked. Don’t know who to call? Try CLICKING HERE to see the homeowner contractor referral page. Happy Fall!